Set on the white sands of Agonda Beach, this Cuba Agonda offers cosy bungalows with thatched roofs surrounded by casuarina and palm trees. It offers a bar and a restaurant serving local and international dishes. There are sunbeds for those looking to soak up the sun. Rooms are simply furnished and come with 2 chairs and a table, wardrobe and en suite bathroom with hot and cold shower facilities. A hammock is also provided. Rooms come with a fan. Tours, babysitting service and bicycle rental can be arranged at Cuba Agonda. Laundry and room service is also available. 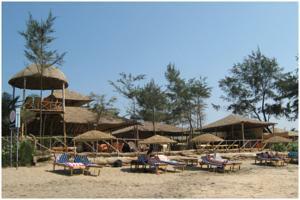 Cuba Agonda is 59 km from Dabolim Aiport and 35 km from Margao/Madgoan Station. Canacona Station is 7 km away. Free parking is offered. Free! One child under 5 years stays free of charge when using existing beds. One older child or adult is charged INR 500 per night and person in an extra bed. Maximum capacity of extra beds in a room is 1. Any type of extra bed or crib is upon request and needs to be confirmed by the hotel. Supplements will not be calculated automatically in the total costs and have to be paid separately in the hotel.